The 7th International Academic Research Conference on “Sustainable Local Development towards ASEAN Community” was held on December 6, at ICIT 2-3 Conference Rooms, ICIT Building, International College, Uttaradit Rajabhat University, Uttaradit, Thailand. The Conference was a collaboration of higher education institutions in cooperation with the Humanities and Social Sciences Academic Research Network. 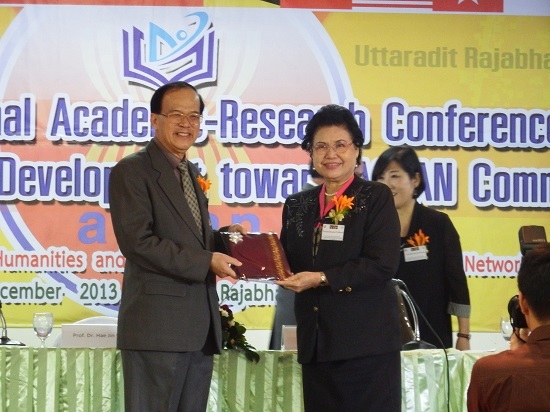 This time, the Faculty of Humanities and Social Sciences of Uttaradit Rajabhat University hosted the Conference which was aimed to prepare for the institution of the ASEAN community and the related social changes at a local level. 4. To publish academic projects and research nationally and internationally.